Dora and Diego: Let’s Brush! With the help of pull-tabs, pop-up characters and an interactive toothbrush that moves back and forth, Dora and Diego turn tooth-brushing into big fun! The ideal way to inspire any tiny tot who finds brushing a bore, this interactive novelty book will banish tooth-brushing tantrums! 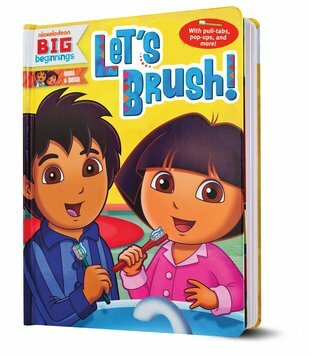 Dora and Diego team up in a terrific tale that teaches young ‘uns how to treat their teeth. A sure-fire hit with kids that makes a daily ritual daily fun!